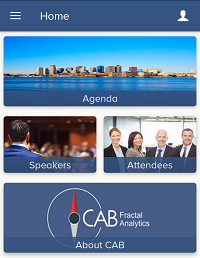 WebMOBI is proud to build the official app of CAB 2017 hosted by Fractal Analytics. 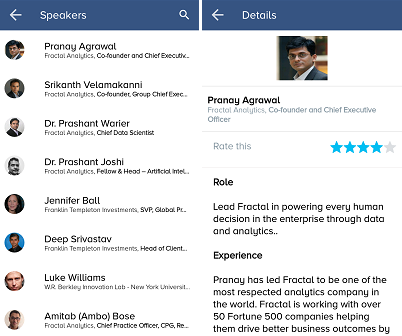 This app helped Fractal Analytics to communicate with their customers attending the event in a better way and improved attendee engagement. Fractal Analytics is an analytics service provider based in the United States and India. Fractal Analytics has been recognized as one of the best companies to work in the professional services industry in a study conducted by The Economic Times. Client Advisory Board is an executive level analytics leaders meeting that is exclusive for Fractal strategic clients. Leveraging data, analytics, and technology for a stronger business performance is the agenda of the CAB. 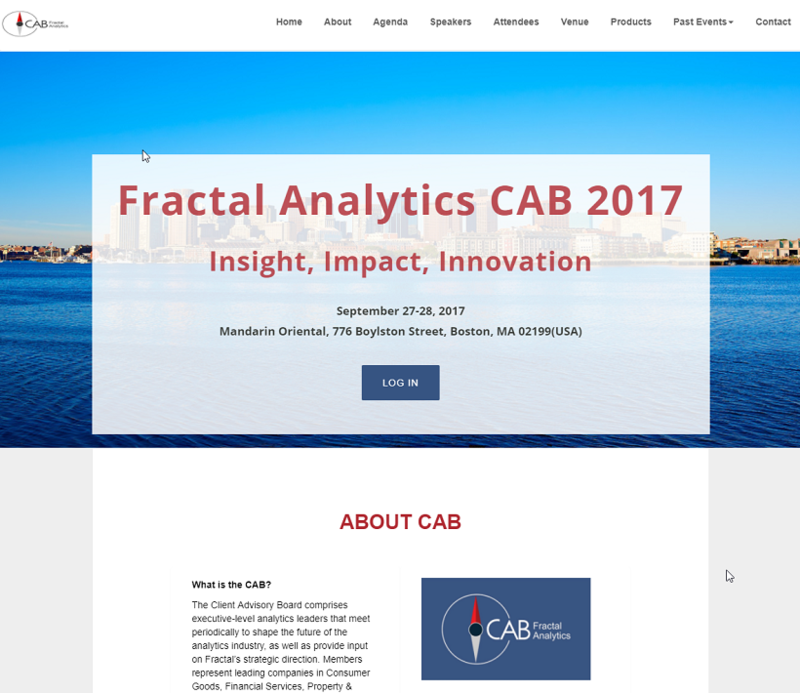 CAB 2017 was hosted by Fractal Analytics on September 27-28, and the team wanted a cross-platform white label app with an integration of multiple features like feedback, CAB portal with information on attendees and guests (current and past), event registration, communication between attendees, email integration, and more. 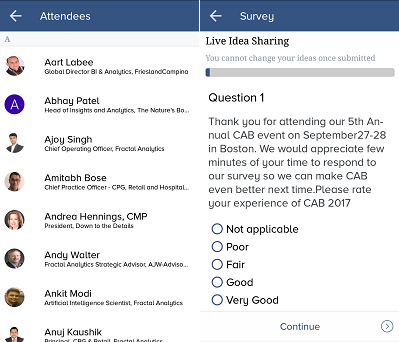 webMOBI team created an enterprise app for “CAB 2017” by integrating features which were active on cross-platform with seamless self-service setup and a delightful user interface. To download the official app for CAB 2017, click the links – App Store | Play Store and the Registration website. Once the user registers in the website the admin will receive a message and has the propriety to approve, decline or hold. Only after the approval the attendee can log in and gets access to the event information. The Home page consists of all the important details regarding the event that admin wants to highlight and make it easy to access for the attendees. The left menu provides complete information about Client Advisory Board 2017 and some interactive features to engage attendees. It has all the options involved in the CAB 2017 like agenda, navigation, list of speakers, attendees list, Fractal products, surveys, feedback, social media integration so on. The right menu contains a personal user option; details like personal schedule, notifications, and settings. This also has a bookmarked option of Fractal products, notes, messenger/chat and personal settings to filter out the required details. This option shows the end-to-end itinerary of CAB 2017 which includes the key details like schedule, the list of events, speakers, keynotes, and more. Attendees can add an event to their Personalized Schedule. The inbuilt map of the venue will help the attendees to stride through the venue without any hassle. Multiple floor maps were added that shows the location with minute details about refreshments booths, washrooms, etc. This feature contains the list of speakers for the event. The attendees can click on the speaker to know the schedule. This can be bookmarked and the attendee has the option to attend a particular speaker’s session. This feature enables the showcasing of the Fractal products which shall help the attendees to get a clearer picture about Fractal Analytics and understand their company better. The list of Fractal products helps to bridge the gap between the company and consumers. The documents will help the attendees to get a run through the past projects and other pivotal details about the company. This feature is an extended version of the documents by CAB which contains clips of the previous CAB events. 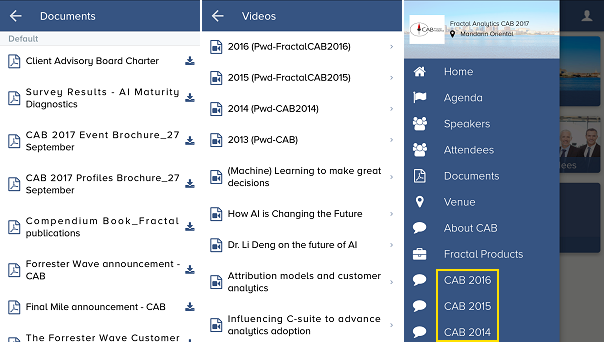 This will help the attendee to view the past events by CAB and understand the event better. Fractal analytics wanted their customers to get a glimpse of previous CAB event information to their customers. The feature modules for these were added in the menu. 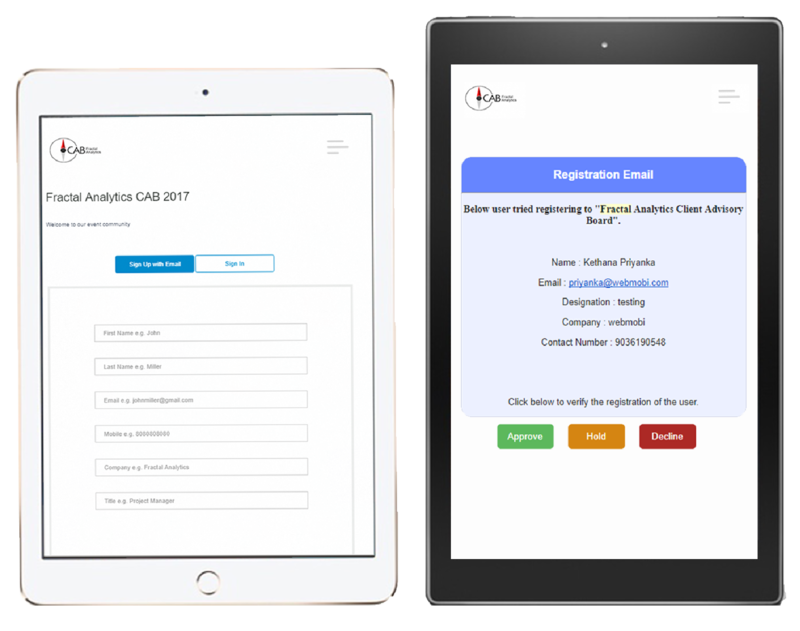 This feature enables the user to know the list of people who are a part of CAB 2017. The list is an amalgamation of exclusive guests and the attendees. This will help the users of the CAB 2017 app to know the keynote guests are ensuring an easy connect. This feature helps the company to get a better picture of the event. The success of an event is measured by the positive audience response and this survey will help in the betterment of the event. Social media plays a pivotal role in our lives and integration with social media handles like Facebook, Twitter, LinkedIn, YouTube and Pinterest will help to reach more people. This is an outlet for both the event organizer and the attendees to share and collect more information about the event. This exclusive feature for the attendee will help to bookmark and list all the needed and interesting information from the event list. This is will the attendee to maintain their schedule. The inbuilt messenger/chat will the attendees to strike a conversation and to build a network. The personalized feature is available on the right side menu. webMOBI has built many white label applications for enterprises and has been instrumental in building customized apps based on the clients’ needs. 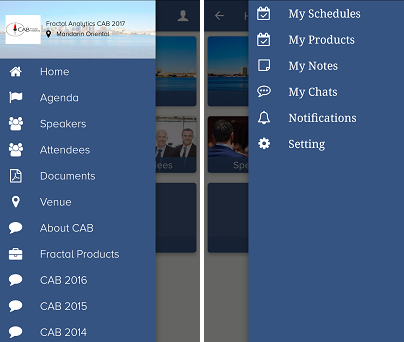 Building an app for CAB 2017 had been challenging and we have emerged successful in building an app that is engaging, informative, with a seamless user interface. We also provide a freemium option for creating apps yourself for small events. These apps will be published within a container app, which is webMOBI App. This is a great way of publishing even large events, especially after the announcement of New App Store guidelines.